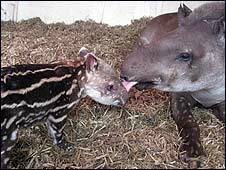 The birth of a Brazilian baby tapir in North Somerset has been watched by people from all over the world via a remote webcam. The device was installed at the Noah's Ark zoo farm in Wraxhall in December when keepers discovered the adult female tapir, Tara, was pregnant. The male was born at 2315 BST on Saturday after a 13-month gestation period and is said to be feeding well. The creatures are hunted illegally putting them on the endangered list. Chris Wilkinson, head keeper at the zoo farm, said: "The remote webcam was installed before Christmas following the discovery that Tara was expecting so that we could monitor her progress throughout her pregnancy. "In addition it allowed us to gain a better understanding of the breeding habits of an animal that is becoming increasingly rare. "A slightly dazed baby tapir was on his feet within minutes and is feeding well." Brazilian tapirs are native to South America and are found in the Amazonian basin.